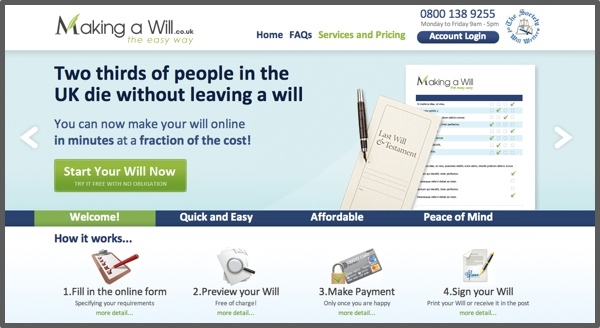 Statistics show that two thirds of all people in the UK die without making a will. If you die without leaving a will it can cause complications for your next of kin. Your estate will be distributed in accordance with the Laws of Intestacty, which means that everything can end up in the possession of the Government, rather than your loved ones. One of Inovica's clients is working to improve that situation my making it easier to create a will, amend and access it when you need to. Making A Will allows individuals, using the online system, to create a single will, or married couples to create a mirror will, that will allow them to set the terms by which their estate is dealt with when the time comes. The user goes through a series of stages, in a very easy to use form format on the website, answering questions to fill out the final will document. The forms are able to expand and contract as necessary and so are extremely flexible for the information that users may need to entire, to document their wishes in their entirety. Once all of the users information is filled out, the will is checked by a professional who is registered with The Society of Will Writers, and then there is option to download the will as PDF, or have it sent out in the post. When working on the project Inovica tried to create a website that was clearly laid out and informative, for people looking for information on creating a will. It needed to be friendly and approachable, as somewhere that people would be happy to enter their personal details and it needed to be highly functional to piece together the will documents that people will rely on in the future. Making A Will is currently going from strength to strength in their goal to make it easier and faster for people to create that all important will document.